Month two in my year-long challenge of doing a portrait a month. Instead of doing one series of 12, I decided to do two 6 portrait series(es?). And instead of doing one series first, then another, I thought it would keep things interesting and alternate between the two. So, to see the first of the Silver Screen Icons series, check out my previous blog here. This is the first entry into my next series “Star Wars: Series 2”. Here is Princess Leia. 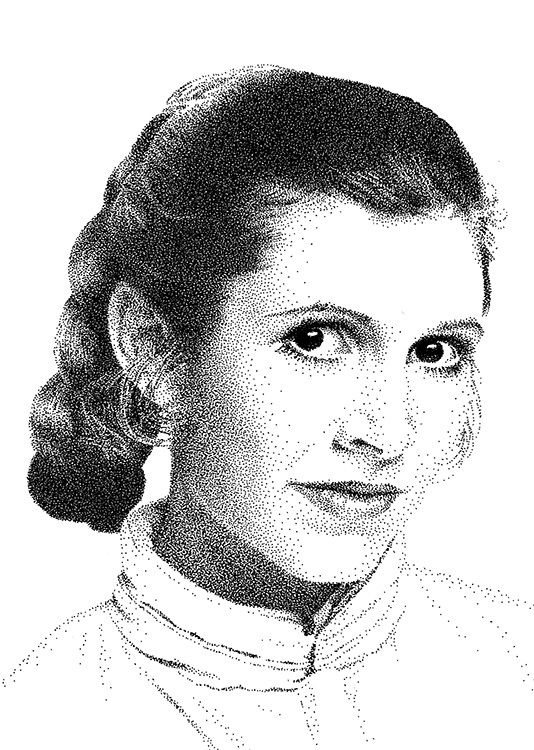 She is also known as Leia Organa, Leia Organa-Solo, and General Organa. But since this image is from The Empire Strikes Back, she was only going by Princess Leia at that time. This image is available for prints or you can purchase the original. They are available right now at MAS Artwork, and are a limited edition of 250. I also did Princess Leia in my first Star Wars series. Here’s a sneak peek at that image. So, next month it’ll be back to the Silver Screen Icons series. And if I didn’t mention it before, it’s going to be boy-girl-boy-girl. So, expect a iconic gentleman of the era. Remember you can go to my website and purchase prints right now! Don’t forget to like, share and all that other social media sharing.